With a strong academic foundation in adva nced hyperbaric oxygen therapy and diagnostic technologies, BaroMedical Hyperbaric Oxygen Healthcare Center is a state-of-the-art facility prioritizing patient-centered care. It provides high quality hyperbaric oxygen and diagnostic services to healthcare professionals looking for optimal healthcare solutions for their patients as well as individuals seeking timely and efficient therapy. Established in 1999, by international scholar Dr. Sanja Savić Kallesoe, BaroMedical is not a typical hyperbaric health and wellness clinic; what sets it apart is its innovative hyperbaric services offered; its commitment to continued advancement and excellence in hyperbaric medicine and its focus on preventive care therapy. “Our primary goal is serving the needs of the individual in an effective, efficient and timely manner,” says Dr. Savić Kallesoe. 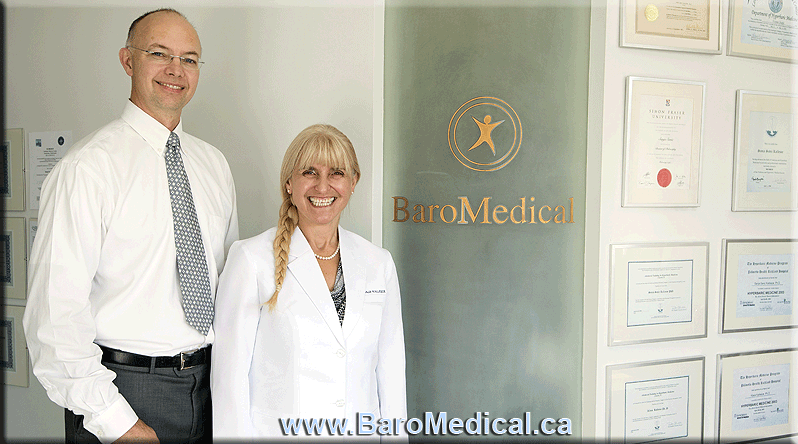 Her pioneering research work in Canada and Europe has formed the basis for BaroMedical. At BaroMedical patients experience exclusive attention for their needs, warmth and compassion while getting access to academic excellency in hyperbaric medicine. Physicians privileged at BaroMedical draw upon extensive professional networks regularly updated through attendance and contribution at international symposia and conferences. Special cases are discussed on-line with world-class hyperbaric experts optimizing the individual's therapy protocol and minimizing delays. “An operational cornerstone for BaroMedical is detecting and preventing diseases early on when they are more effectively managed and treated,” says Dr. Klaus Kallesøe, clinic director and neurophysiologist. Health Canada describes hyperbaric oxygen therapy as a well-established medical treatment recognized for a specific set of conditions. This includes carbon monoxide poisoning, injuries linked to reduced blood flow, and enhancement of wound healing in diabetic foot ulcers. In these cases, exposing the body to 100 percent pure oxygen inside specially pressurized chambers will increase the amounts of oxygen dissolved in the patient's blood by up to 30 times. In turn, this facilitates an anti-inflammatory response, promotes growth of new capillaries and stimulates release of stem cells in favour of speedy and effective recovery. Oxygenation of the body rebuilds microcirculation in all organs, decreasing pain, infection, swelling and inflammation, all of which promotes healing and recovery. Quick results are seen in sports related injuries as well as slow healing diabetic wounds. In cancer, hyper-oxygenation slows tumor growth and metastasis, as well as speeds up recovery after surgery. Oxygen enhances the effect of chemo- and radiation therapy reducing their complications and side effects. Neurorehabilitation in post concussion and stroke patients depends greatly on oxygen availability in the recovering brain. "When adding oxygen therapy early in rehabilitation the "sleeping” brain cells awaken and we see huge improvements in motor, cognitive and executive function, even years after a stroke," Dr. Kallesoe says. Our mission is to provide access to timely and safe hyperbaric oxygen therapy for any user making an informed and educated health care decision. We are dedicated to education, research and promotion of the field of hyperbaric medicine and are continuously updating or training in the use of the latest techniques and technologies. Our therapy programs can be customize for the individuals need to tie into the existing health care program. We provide feedback reports and evaluations to your doctor, naturopath or other health care professionals in charge of your care. At Baromedical we focus on preventive health care with hyperbaric oxygen therapy. We are proud to be recognized as a premier hyperbaric service provider and educator in our community. We maintain highest standards of expertise and ethics in our work by earning respect and trust of our clients and health care referral centers. She has been involved in the field of hyperbaric physiology since 1986 and initiated establishment of the first hyperbaric centre in her native country Slovenia in 1989. She was a staff member for five years at Slovenia’s largest University Institute for Rehabilitation Engineering – the Jozef Stefan Institute – in the capital of Slovenia, Ljubljana, where she was part of a group pioneering the European development and implementation of electrical stimulators in people with stroke and spinal cord injury at the rehabilitation centre “Soca”. In the early 1990’ies the Slovenian Ministry of Science and Technology awarded her a research grants to pursue academic collaborations in Canada on the use of two successful modalities in faster wound healing: electrical stimulation and hyperbaric oxygenation. Throughout the ’90’ies she was teaching and leading research at Simon Fraser University, British Columbia, collaborating with the local medical community (Medical Hyperbaric Unit at Vancouver General Hospital, as well as BC Cancer Control Agency) and with international diving industries (CanDive, International Hard Suits, CanDive Marine Services and Mustang Industries). With her academic and industry experiences she identified the need for general public access to hyperbaric oxygen therapy in BC and founded the first private medical health care hyperbaric centre – BaroMedical. The centre provides adjunct services to other health care providers recognizing the value of oxygen in treatment of various ailments. The centre includes a complete microvascular assessment laboratory (first in Canada) for non-invasive screening of peripheral vascular insufficiencies. The BaroMedical Hyperbaric Oxygen HealthCentre operates as both a therapy clinic as well as teaching facility. As of 2015 she has trained more than 25 physicians and hosted countless seminars and presentations on hyperbaric medicine and microvascular assessment . Dr. Savić Kallesoe is a regular attendant and speaker at national and international symposia on hyperbaric medicine and wound care. He acquired his academic background in biomedical Systems Engineering in his native country Denmark and has worked and trained in Canada since 1990. He has co-authored several biotech patents related to neuroscience and rehabilitation inventions and has been involved in startup of biotech industries. At BaroMedical Hyperbaric Oxygen Health Centre his technical expertise in diagnostic technologies has been the foundation for development of microcirculation assessment procedures to improve the success of medical treatments and speed up recovery in rehabilitation. He has been featured in talk shows and news media and is a regular attandend at national and international symposia on hyperbaric medicine.